If nothing else, Halloween can be a really good reason to have a get-together with friends. We had a great time celebrating with some of our good friends. Life has changed quite a lot at Mook & Lulu’s in recent years. I now work full-time, juggling work, school, family and all the other bits and bobs – and mostly everyone ends up where they should be, when they should be there, mostly! Though, like many working parents, I’m quite often ‘flying by the seat of my pants’ – things get done, but more often than not, rather last minute. 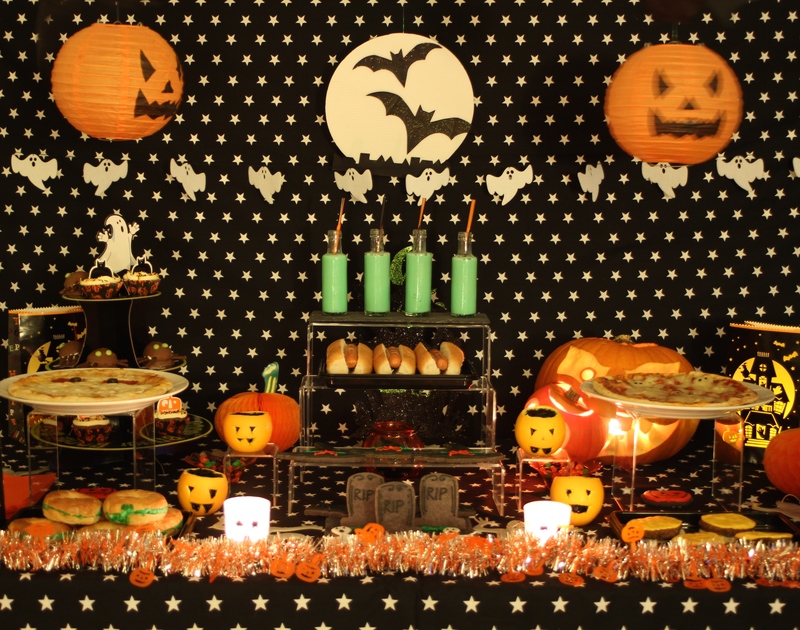 So, here is our post for this year – showing us getting ready for our celebrations with friends and a ‘last minute’ easy decoration to try if you’re celebrating Halloween at home this year. Our ‘Day of the Dead’ pumpkin- expertly carved by Mr Mook & Lulu’s – come back later for a photo of the it illuminated! So, if you’ve got a spare hour or so, some black wool or string, some drawing pins or nails, and a hammer (depending on your walls), then you could make this giant spiderweb. Start by cutting lengths of wool or string to make a cross and secure with pins or nails. Create lengths unevenly spaced on top of the cross to make additional cross sections. Then starting from the centre wrap around each of the ‘spokes’ as you reach them and build out in a spiral to form your web – adjust the wool to create the effect you want as you go. So, I’ve had a very useful tutorial from Mook, and here are the results! A little bit of Halloween fun all rolled up into a video short. PS Watch for the first appearance of the newest member of family – Huggy! My exceptionally talented little Mook has created this spooky trailer for the Mook and Lulu blog – I fear we have already reached the point where my 10 year old daughter is more media savvy than me!